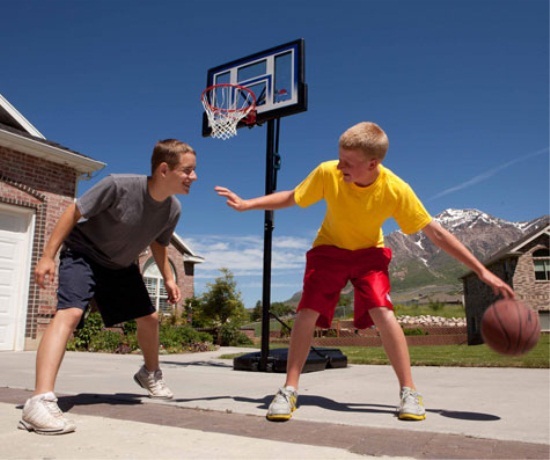 The Lifetime 51550 Portable Basketball Goal System is both a fun and economic choice for any family. This portable basketball system comes with a 48" Shatter Proof Fusion Backboard with UV protected graphics to prevent yellowing and fading. Shatter Proof backboards are made of Makrolon Polycarbonate which is virtually unbreakable and many times stronger than acrylic. Weather resistant features include powder coated steel, UV-protected backboard and a high density polyethylene portable roller base. 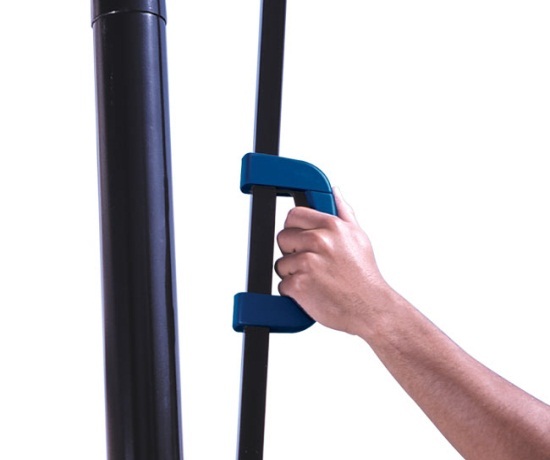 The Speed Shift adjustable height mechanism makes it possible for players of any age or skill to adjust the height. Being that it is portable, you can move it to any desired location and you don't have to pour cement or wait for it to dry. All you have to do is fill the base with sand or water and you are ready to shoot some hoops. This basketball system comes with a 5-year warranty from Lifetime Products for United States and Canada customers. Dimensions: 48 inches W x 30 inches H.
Backboard material: Makrolon poly carbonate. Backboard thickness: 2.5 mm (.09 inches). 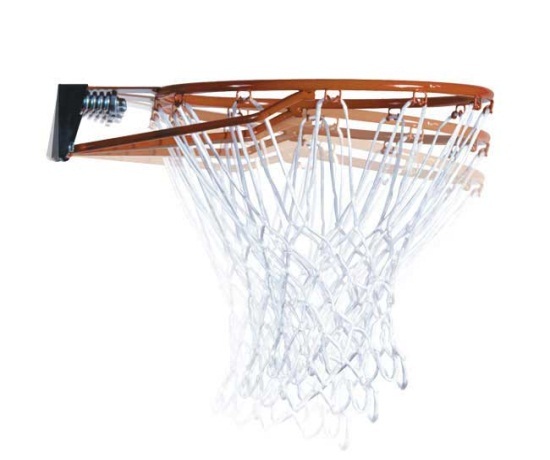 Backboard frame material: high-density polyethylene (HDPE) plastic. Backboard to pole clearance: 18 inches. Rim uses a double-spring compression mount. This rim holds up well to aggressive play. Pole size and shape: 3-piece, 3 inch round pole. Uses a Speed Shift to adjust the backboard up and down. 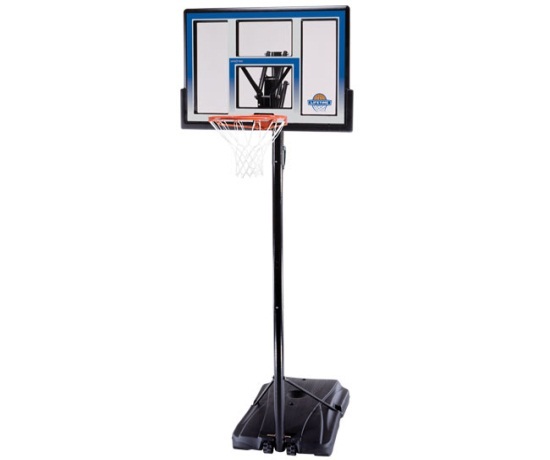 Comes with a basketball pole pad to help protect players from impact with the pole. The Speed Shift uses a single handle that uses squeeze trigger to activate the mechanism. Rim height adjusts from 8 feet to 10 feet in 6 inch increments. Portable base size: 31 gallons. Base footprint: 46.75 inches L x 30 inches W.
Weight of the base when filled with water: about 248 lbs. Typically, filling the base with sand makes the base weigh about 1.5 times more than filling the base with water. This weight factor will change depending on the density of your sand. Shipping dimensions: 48.7 inches x 32.8 inches x 10.3 inches. Excellent service, communication and price and super fast shipping- Thank you! Excellent communication and quick shipment, thanks. Q: I'm having troubles with the adjusting and it won't work with locking it in place and it is stuck at the lowest height there is can I get some help? A: You will want to call 800-225-3865. Q: Is this a good system for a younger child? A: Yes. 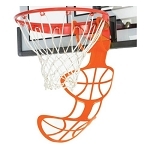 This is an excellent beginner level basketball hoop. 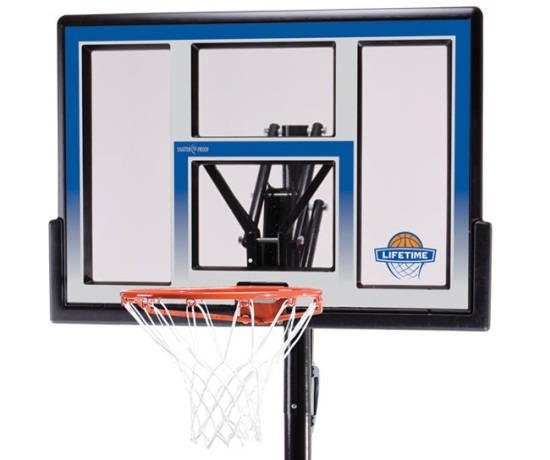 The adjust ability of this backboard system allows the rim height to be set as low as 8-feet, allowing even young children to reach the rim and start learning to shoot. 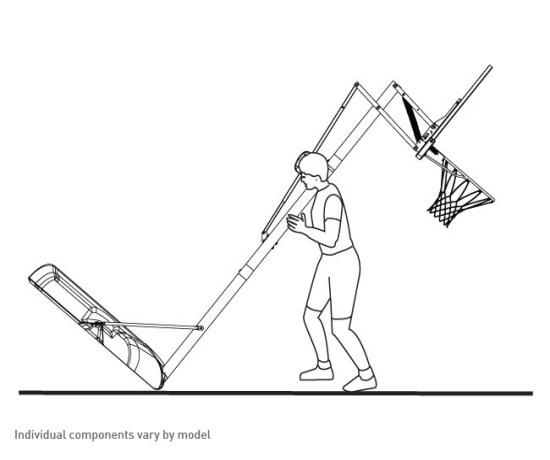 Q: Should I use sand or water to fill the base of this portable basketball hoop? A: Either option is fine. When filling the base with sand, the weight of the base is typically about 1.5 times the weight as when the base is filled with water (depends on the density of the sand you use). A base filled with sand will typically provide greater stability, but will also be more difficult to move around. 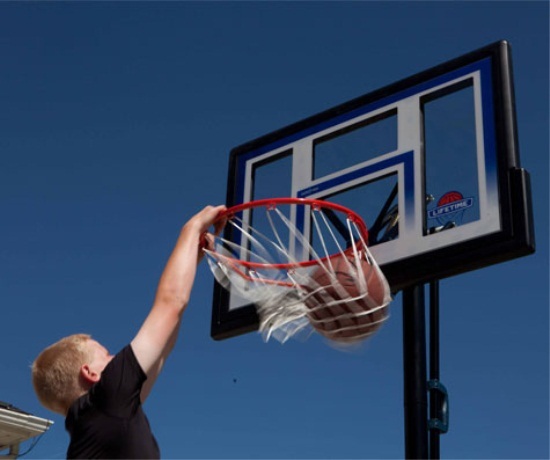 Q: Can a young child raise and lower the backboard height? A: It depends on how you define young. Generally around the age of 10 you can lower and raise this under the supervision of an adult. Fast Shipping: Orders for the Lifetime 51550 generally leave the warehouse within 1-2 business days. Dimensions: 49" x 34" x 10"